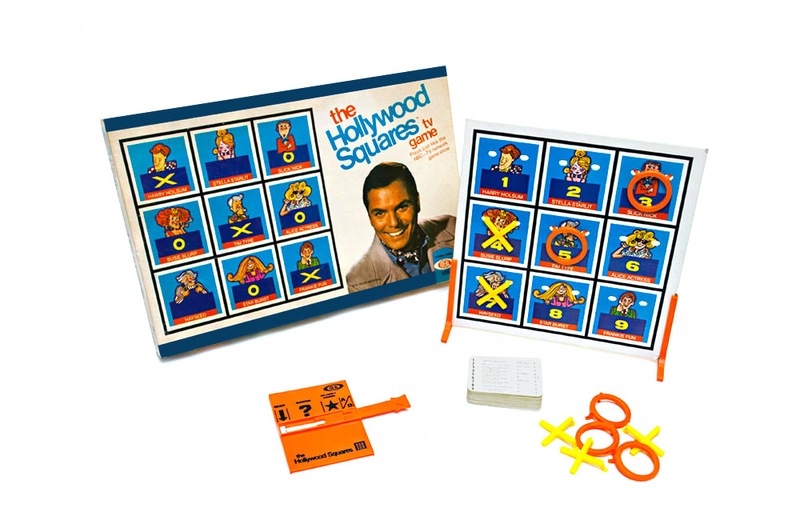 Released in 1974 by the Ideal Toy Company, The Hollywood Squares TV Game is modeled after the game show of the same name, which originally aired on NBC from 1966-1981. Prominently displayed on the box is a photo of Peter Marshall, who was the original host of the television version throughout its entire first run. The popularity of the show was driven by the Love Boat-esque collection of B-list celebrities that occupied each square of the 3×3 tic-tac-toe grid. The group frequently answered the questions posed to them with humorous and sometimes bawdy responses. Over the years, the “center square” was reserved for the most bankable star, held down by such Hollywood luminaires as Buddy Hackett, Paul Lynde, and Ernest Borgnine. Due to licensing restrictions, Ideal replaced the show’s star-studded lineup with a group of caricatures with humorous gag names, like “Stella Starlit”, “Harry Holsum”, and “Hayseed”. Despite this change, the board game is also based upon the game of tic-tac-toe. Players are presented with a series of true/false (“Agree” or “Disagree” in Hollywood Squares-speak) trivia questions from a deck of 56 double-sided cards. A correct answer allows the player to place their X or O on the selected space in the 3 x 3 grid. An incorrect answer awards the space to their opponent. The object of the game is to win two out of three matches. Collecting toys can be a wild ride, with various factors unpredictably affecting a toy's value. But LEGO products are historically reliable, climbing in value year after year, thanks in part to the company's practice of retiring sets after about two years. Check out these five LEGO sets that stand out as collectors' Holy Grails. Growing up in rural Massachusetts in the ’70s and ’80s, the Big Wheel was a big deal. On my street this toy “low-rider” with a huge front wheel was a status symbol that afforded the rider street cred.